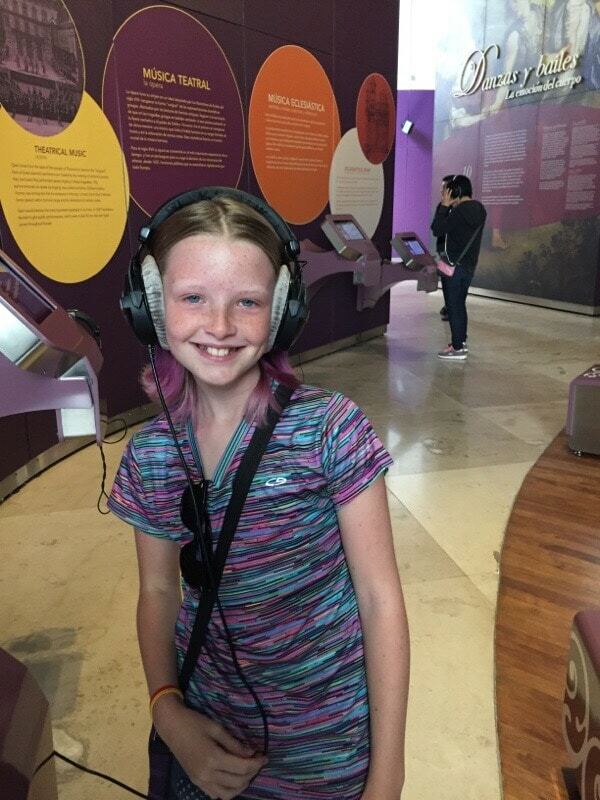 On one of our last days in Puebla we decided to museum-hop. 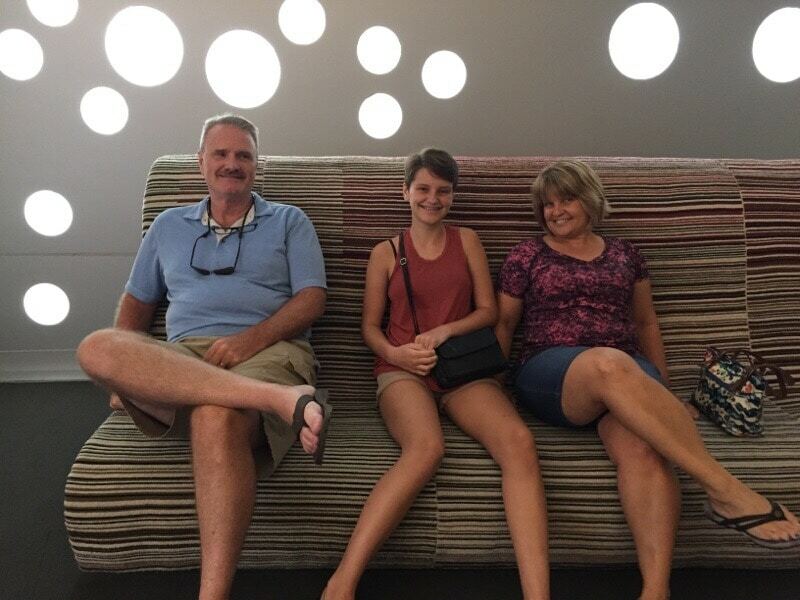 We had seen a lot of museums on some of the tours around town and we allotted a whole day to check them all out. We got a late start (we are the Shermans, after all) but we decided we had to start with Barroco. This was a museum I had read about a few months ago and it’s what put Puebla on the map for us. We heard great things about it and how it was interactive and interesting. So finally we carved out a day to check it out. From the outside it looks very modern. By the time we went I had completely forgotten what was about. Modern Art? History? Anthropology? I really had no idea what to expect. But off we went, paid our 200 pesos ($11USD) for all 4 of us and we were in. Turns out Barroco is Spanish for Baroque. Oh, got it! And the entire museum was dedicated to the Baroque style. It was fascinating! 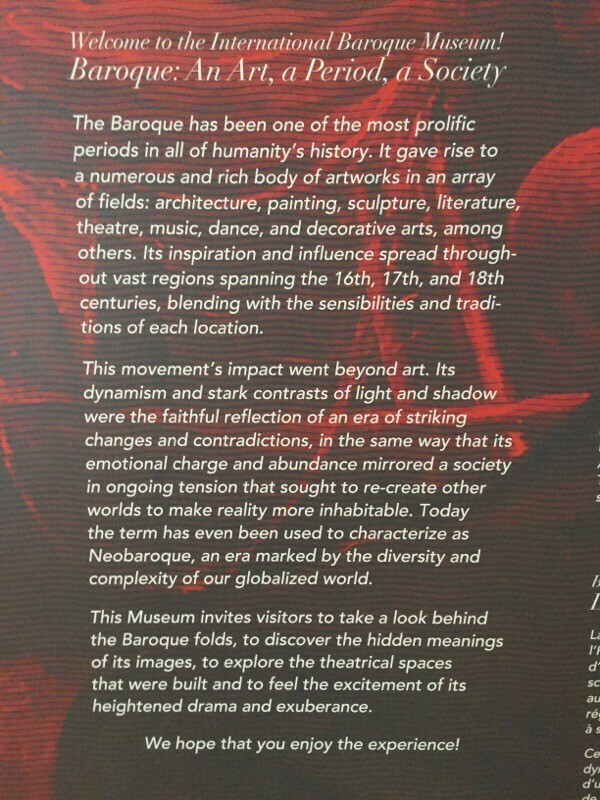 I had heard of baroque before but had no idea what really defined it. But we learned it is intricately linked with the time period in which Mexico was invaded by Spain and, after a time, came to be appreciated as a style that represented much of the 16th to 18th century in many places around the world. I won’t go into too much detail for fear of boring you (not like that’s ever stopped me before) but the French word baroque is derived from the Portuguese word “barroco” or Spanish “barrueco” both of which refer to a “rough or imperfect pearl”. They named it that because it was not highly regarded at first, it was looked upon as something strange and uncouth. But after about a century it became to be appreciated for what it is. Baroque style really covers so many areas: architecture, music, arts, books, sciences, furniture, clothing and more. This museum had a room for each of these subjects and went into detail on how the discovery of new lands led to the sharing of techniques and materials and mediums, which led to a bit of an amalgamation of styles. 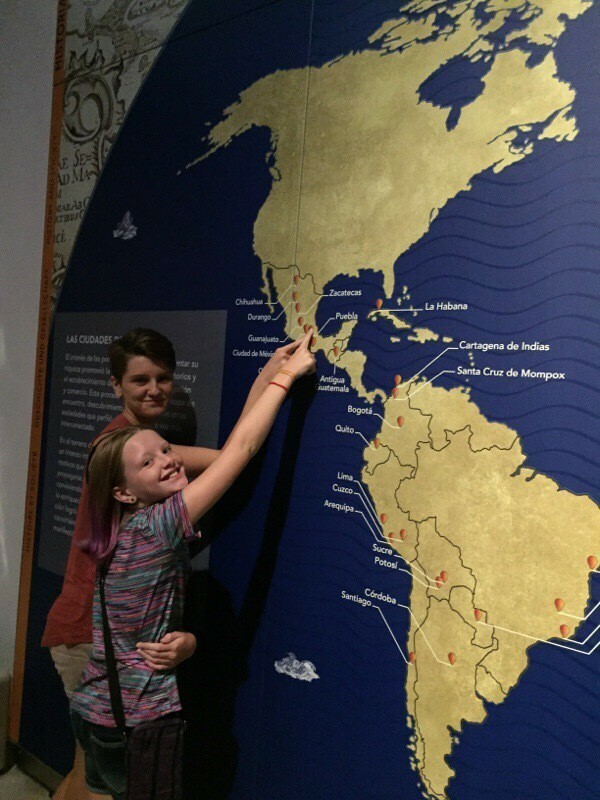 We wandered from room to room, we read plaques (most were in English as well as Spanish), we played with the touch screen informative boards, we listened to music or little demonstrations, we pointed things out to each other and we just explored. It was really fascinating and now that I’ve been there I notice so many things that are of the Baroque style. Ohhh! 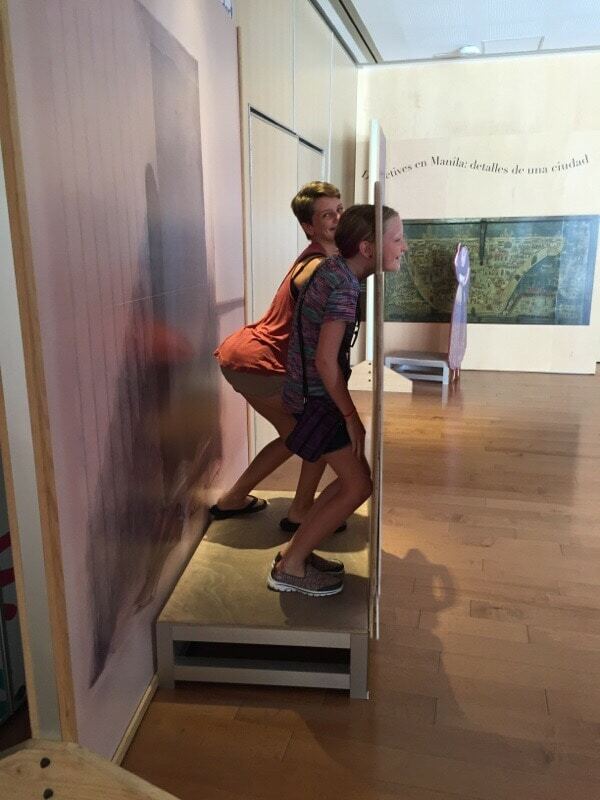 So this is what the museum is all about! Fascinating. We realized how much of our future travels will be to places where the Baroque style is prominent. 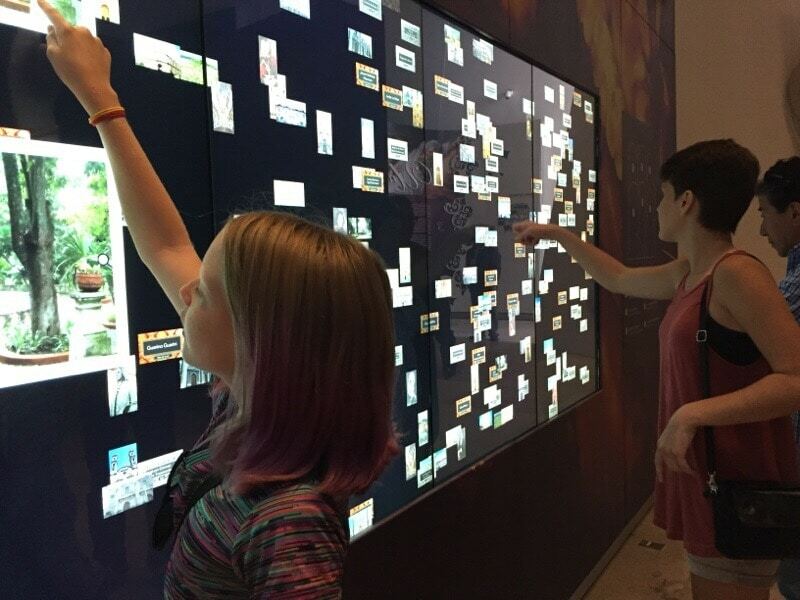 The interactive displays were so neat. You could just touch something and learn more about it. Zoe listening to a few samples of music. There are actually two categories of Baroque music. One for public concerts and large audiences and one for private listening in your own music chamber. Who knew?? 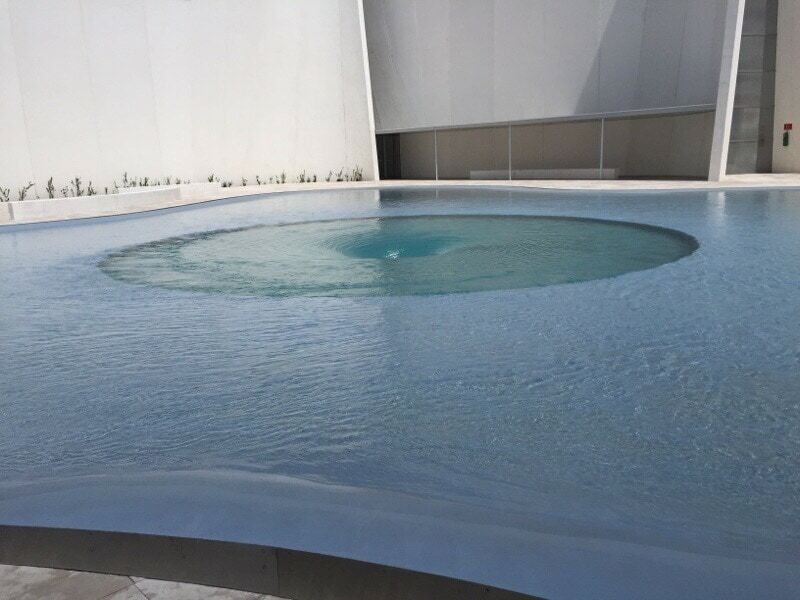 A whirlpool out in the center area. Kinda freaky if you were going to swim in it. Not related to Baroque though. Just cool to look at. Obligatory cheesy photo board from the side. It’s funnier that way. One museum and we are tired. We need to work on our Museum Stamina. We spent so much time at this museum that it was now 4 o’clock in the afternoon and we decided that one museum was enough of a hop for the day. 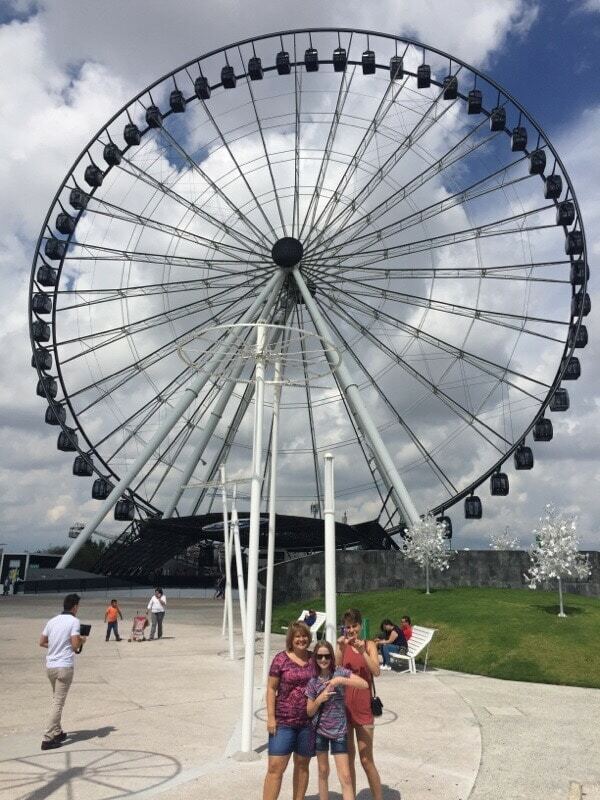 We had passed the largest Ferris Wheel in the Americas on our way to the museum so we decided to go back there. This was the one and only time we took a taxi and he completely ripped us off. And you wonder why Uber is so popular. I’m going to let Dan finish this blog post with the experience of the Ferris Wheel. As you’ll soon learn, I only experienced about 30% of it. Okay. So this is Dan. 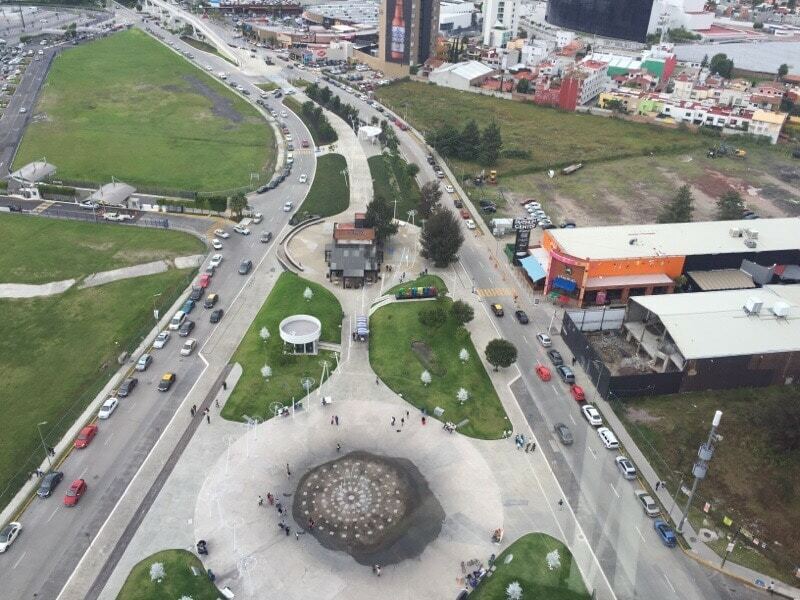 Puebla is quite the town. Huge churches, great museums, oldest library in the Americas and to top it off, they also have the biggest Ferris Wheel in the Americas. When you approach it, it doesn’t really look all that tall. I mean, it’s doable. Right? We decide to buy the VIP tickets. That gets you your own pod and to step it up a notch, the VIP pods get a glass floor. Fun right? VIP pod cost US$15. We get our ticket and it has a time stamped on it. We have to wait for about 20 minutes. The ride takes about that long. So we wait. Doesn’t look so bad, right? Everyone is excited! We’re finally called to our pod. The Ferris Wheel looks new and it has very nice pods, with comfortable chairs for 6 people so with only 4 of us it’s even better. We get settled into our seats and all is wonderful. For about 4 minutes. That’s when things got real. This Ferris Wheel is SKY HIGH!!!! We got 1/4 of the way around when Allison decides that her anxiety was not going to allow this to happen. The rest of us were getting a little wide eyed too. 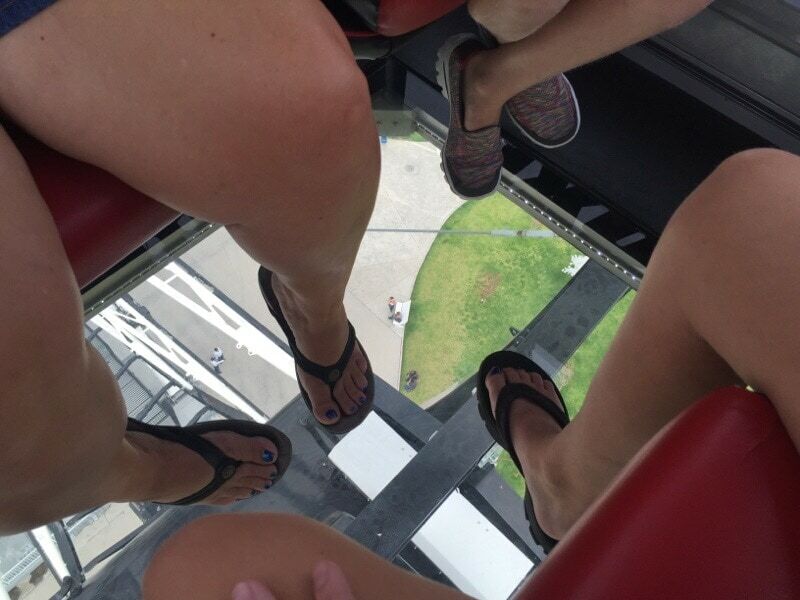 But Allison took fear of heights to a whole new level. Unfortunately, to all of our delight, it was pretty funny. She put her sunglasses on, ear buds in her ears and her head down. She didn’t see or hear anything until the last quarter of the circle. In order for her to make sure she didn’t hear any of our exclamations and comments about the height, she even started to sing under her breathe to the music she was listening to. She had to get into a zone to make it through the experience. Probably for the best because it was downright frightening if we’re being honest. 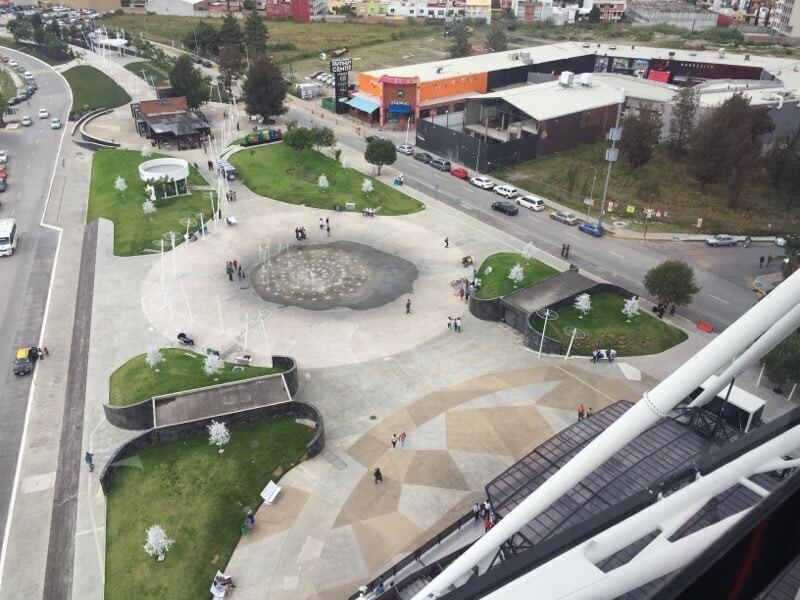 That Ferris Wheel isn’t the biggest in the Americas for nothing. Wow. We got a video of Allison in her “zone”. But she has banned it from being viewed by the public so you’ll have to settle for a picture. Allison is checked out. Zoe is laughing. This was before the panic got so bad that headphones had to go in. Glass bottom. Who thinks of these things? Why? Starting to get pretty high. VERY high. Allison never saw this view. But we lived to tell about it and now we know why Allison carries earphones in her purse. She thanks Fergie for helping her through the ride. I learned SO much today! Thanks! Mark is always pointing out things in the baroque style to the kids and I and I usually nod and say, uh huh, but have no idea what I’m looking at. Thanks for the info. That Ferris wheel gives me the willies just looking at it. Kudos to you my friend. I’m feelin ya. Sherry, the museum was so educational. Now that I know what to look for I see it everywhere. We learned that they did not like empty spaces in the Baroque era, so when you see churches that have every square meter decorated, you know it’s Baroque. 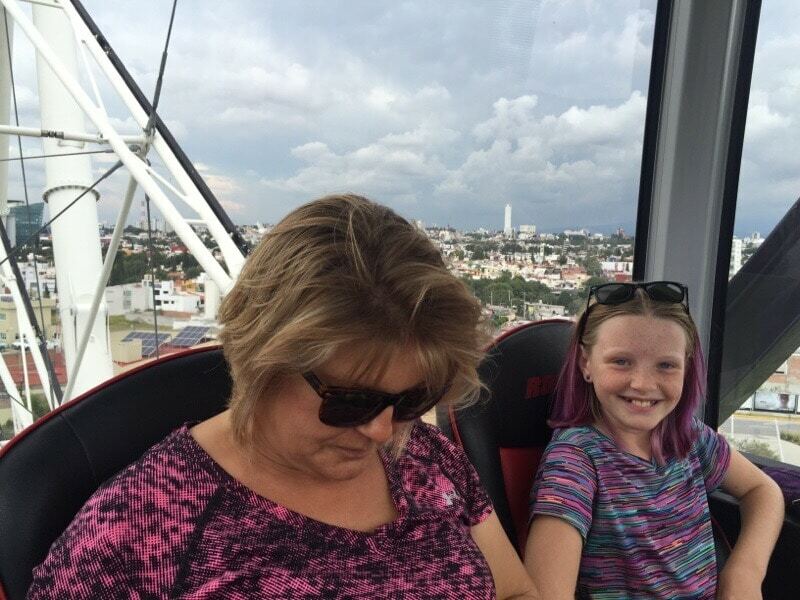 The Ferris Wheel was a nightmare. The only saving grace was that it moved slowly so if you shut your eyes and block out as many senses as you can, you can pretend you are elsewhere. Like in London with Fergie.